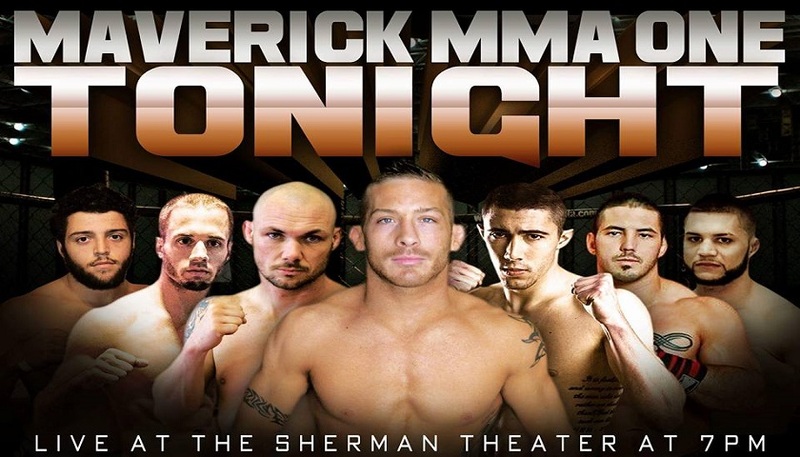 Tonight Maverick MMA holds their inaugural mixed martial arts fight card from the Sherman Theater in Stroudsburg, Pennsylvania. The card delivers six professional and two amateur MMA bouts with two titles on the line. In the main event, Scott Heckman made his return fight after retiring from the sport in 2016. He took on Steve McCabe, another 20-plus fight Veteran. In the co-main event, Tim Kunkel and Mike Trizano duked it out for the organization’s lightweight title. Earlier on the card, Timmy Tyler and Mike Delouisa went to war for the amateur 165-pound organizational title. Tyler vs. Delouisa was the second of only two amateur fights on tonight’s fight card. In the main event, Scott Heckman got the fight to the ground, landed a few shots and sunk in a D’Arce choke to win his first back since his retirement last year. Mike Trizano put Tim Kunkel out stiff with one big punch early in the first round. Kunkel went down face first and hit the canvas hard. It was a scary thing to watch. Luckily, Kunkel came around quickly, stood up, and congratulated the new champion in Trizano. HOLY HELL!!!! Mike Wade dropped Alec Hooben in the opening seconds of their fight. Wade pounced on Hooben. Hooben regains composure, stands up, lands a few knees in a Muay Thai clinch and drops Wade to the mat. Hooben follows up with a few punches before referee Jimmy Chappell calls an end to the fight. The first round of Rick Nuno vs. Steve Jones showed an extremely dominant performance for Jones. Jones went for the glove touch in the opening seconds but Nuno wanted no part of it. Nuno, returning to MMA since coming back from several boxing contests, was taken down several times by Jones who used his size and power to maintain dominant position the majority of the round. No real damage was inflicted by either fighter in the first round but the demonstration put forth by Jones was quite impressive. In the second round something happened to Jones as he went in for a takedown and there was a wince of pain on his face. The fight continued and Jones went for another takedown but you could see he was not able to fully commit. Seconds later the two were clinched up when an accidental groin shot to Jones halted the contest momentarily. When he action continued Jones took Nuno down from the waist but as he stood up again he winced in pain and Nuno took advantage, pounced on Jones, and referee Jimmy Chappell called an end to the contest. Tommy Espinosa defeated Greg Saumenig via TKO from unanswered elbows about midway through the first round. Saumenig started strong with a takedown, followed by a left hook once back on the feet, and then another takedown, but Espinosa moved out of harms way and put himself in a dominant position where he was able to deliver what seemed like more than 50 unanswered elbows. Granted many of them were blocked by Saumenig, the ones that got through echoed throughout the Sherman Theater. Mike Delouisa defeated Timmy Tyler via submission in the very first round to capture the amateur 165-pound title. Delouisa missed with a spinning backfist and stumbled a bit but recovered and got Tyler to the ground with a takedown. From there he easily transitioned to a head and arm choke and put Tyler to sleep for the victory. The second round opens up with Territo attempting a superman punch and missing allowing Cuevas to take the fight to the canvas. From there Cio is on top, presses Territo’s head up against the cage and lands a few bombs. Now stacking Territo up against the cage Cio lands a big knee. Territo turns over and Cio continues the punishment with knees to the body. A dominant third and final round for Cuevas who almost finished the fight with a kimura. Territo worked through it, and the hold transitioned to an armbar but managed to escape and land a punch of his own in the final seconds. The fight goes to the judges with Cuevas getting his hand raised.